T-R PHOTO BY ROSS THEDE - MHS junior setter Madi Finch makes a pass during the third set of Thursday’s volleyball match against Ottumwa at the Roundhouse. The Bobcats swept the Bulldogs, 25-20, 25-16, 25-21. Marshalltown head volleyball coach Chris Brees has given his junior setter Madi Finch free rein to go on the attack, yet her game-winning point to close out the second set stunned even him. It surprised the visiting Bulldogs, too, and that was the best part. 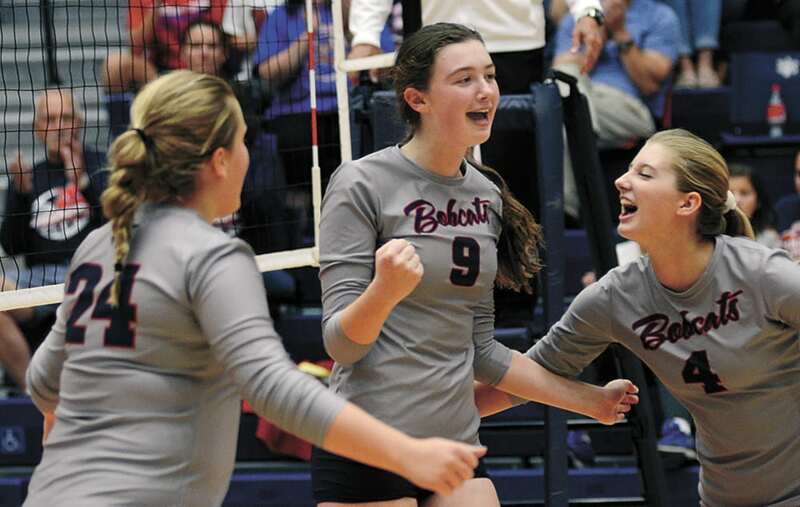 Finch was one of four Marshalltown players to post season-high kills as the Bobcats turned back Ottumwa in straight sets, winning 25-20, 25-16, 25-21 in Thursday’s cross-CIML match at the Roundhouse. Finch finished with a season-best four kills, including that final point of the second set when she went up for a jump-set and instead dumped the ball back over her head for the last point. None of the Ottumwa players were even close enough to it to attempt a diving save. T-R PHOTO BY ROSS THEDE - Marshalltown freshman middle hitter Autumn Finch (9) celebrates a kill with teammates Hayden Oekter (24) and Gabby Himes (4) in the third set of Thursday’s cross-CIML volleyball match against Ottumwa. Finch had a season-high eight kills in the Bobcat sweep. Finch also handed out 25 assists at the center of a Bobcat attack that needed a boost during the opening set and found it in junior right-side hitter Gabby Himes. Instead of opting for a bolstered block with junior Tasia Pohle and senior Yatnia Hernandez, Brees went to his bench for the left-handed who made an instant impact on offense. “We’ve found the rotation that we want, it’s just we have to find the consistency,” said Brees. “I felt tonight both outside hitters were very consistent, and freshman Hayden Oetker probably played the match of her career so far. Erica [Johnson] is always solid for us out there, but we have to have that third person to put the ball away. Himes ended the night with three kills and no swinging errors on eight attempts, striking the ball crisply each time she got the chance. It appeared to alter Ottumwa’s defensive alignment, Brees believed, because the rest of the Bobcats got going as soon as Himes started hitting hard down the line. T-R PHOTO BY ROSS THEDE - Marshalltown junior outside hitter Erica Johnson comes up with a dig during the third set of the Bobcats’ 3-0 sweep of Ottumwa on Thursday night at the Roundhouse. Johnson had a team-leading 10 kills to go with a season-high 16 digs. Marshalltown (5-8) didn’t score a point off the block but got its hands to a lot of Ottumwa attempts, holding up the Bulldogs (3-8) just enough to start gaining ground on the scoreboard. After Ottumwa got out to a 10-4 lead in the opening set, the Bobcats’ lineup change got the desired result and MHS started reeling them in. 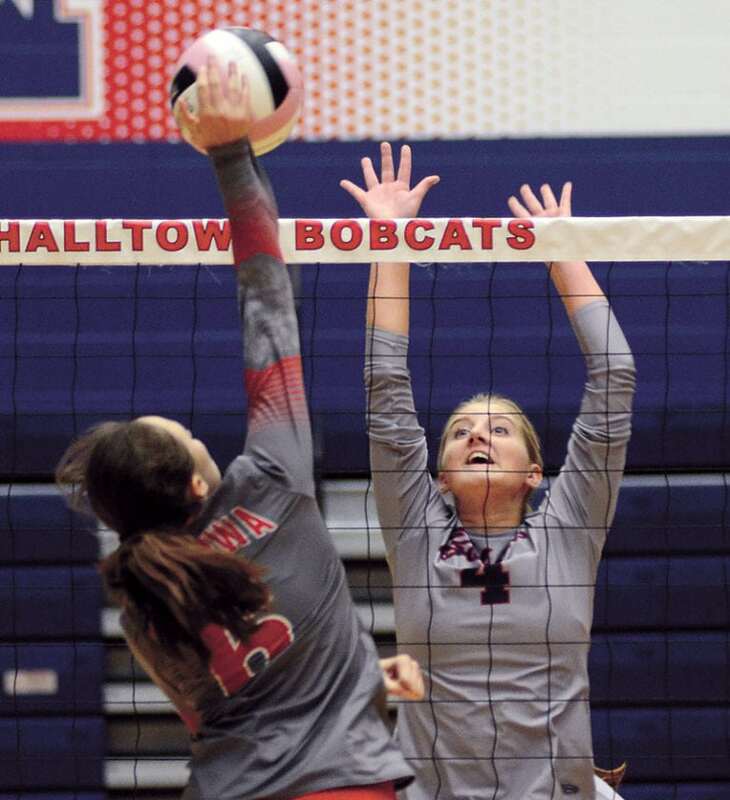 Autumn Finch scored consecutive points for the MHS and Madi served up three more — one on a kill from Oetker and another on an ace — to give the Bobcats their first lead of the opening set. Autumn converted another kill from the right side, Grace Fisher chalked up an ace and Marshalltown’s offense turned Pohle’s block into a successful kill for Hernandez to make it 22-16. 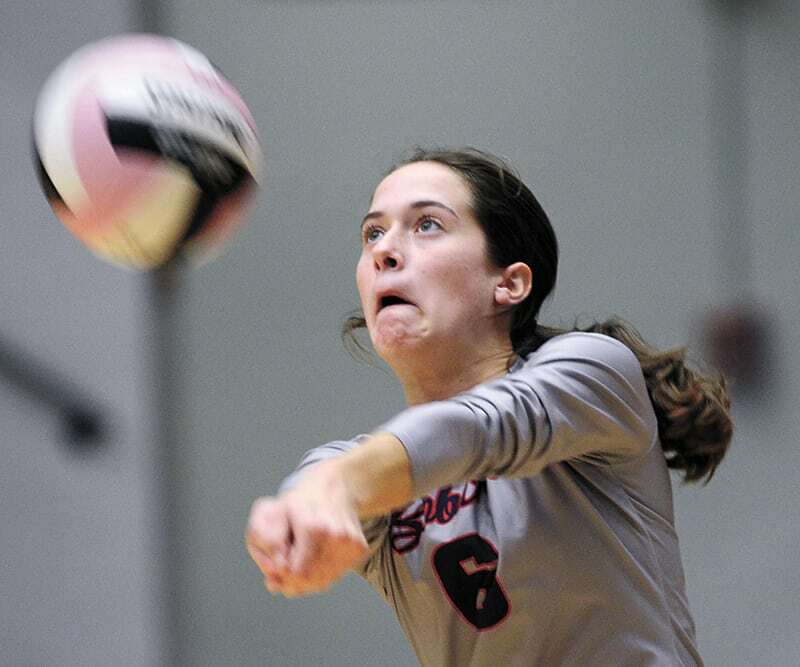 Oetker tallied another kill and Ottumwa errors accounted for the last two points of the first set. 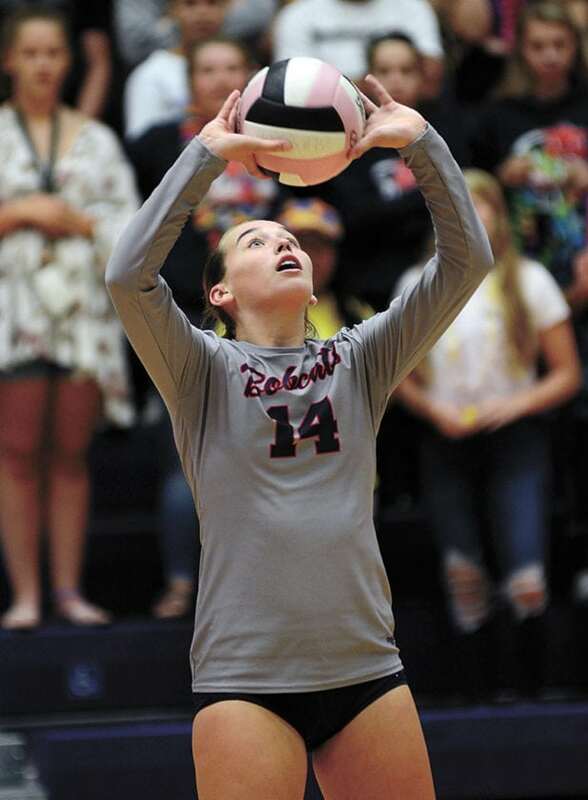 The Bobcats surged out to a 17-4 lead in the second set and eventually put the Bulldogs down 25-16, but Ottumwa returned fire to kick off the third set. Sophomore middle hitter Anna Guest got her team out to an 8-5 advantage that disappeared just as quickly when Madi got the service back on an Oetker kill. Autumn put down an Ottumwa overpass and another kill from Oetker got MHS in front 9-8 and the Bobcats never trailed again. Johnson (10 kills), Oetker (nine) and Autumn (eight) all finished with season-high kills, and Madi’s assist total was her top tally so far this fall as well. MHS senior libery Alyvia Chadderdon had a team-leading 20 digs, Johnson added a season-high 16, and Madi added 11 while serving a whopping 22-for-22 with an ace. 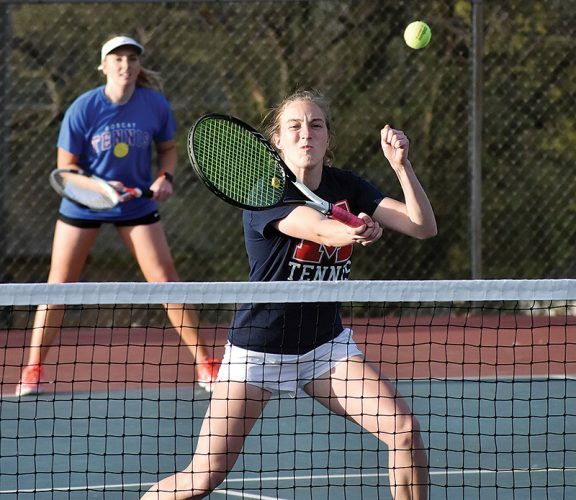 Chadderdon was 15-of-15 with an ace, while Fisher finished 9-for-9 in her limited role. “We do have those people who specialize. I’m not putting Grace Fisher back there just to get Grace in, I’m putting Grace back there because she has one of our best short serves and she gets us points in that rotation,” said Brees, “and I thought Kassie McGerr pushed us ahead with three really nice serves and she dug a nice ball. 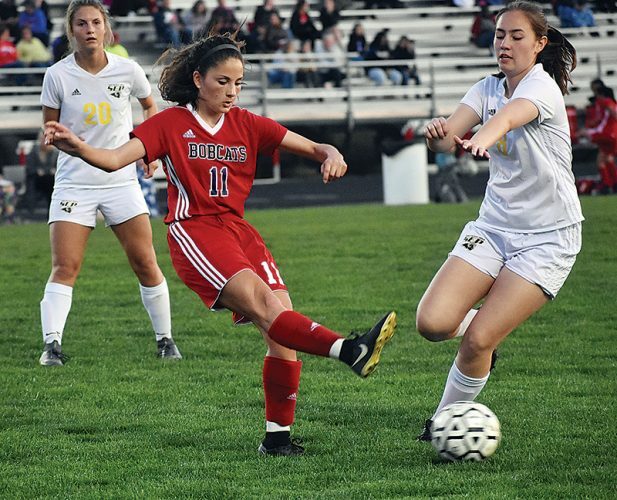 The Bobcats have a few days to recuperate before traveling to face Fort Dodge in Tuesday’s CIML Iowa Conference match.